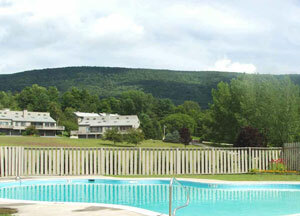 Torbank condominiums are available in 3 and 4-bedroom units and offer fantastic mountain views. These condos are located just off of Route 7 on VT Highway 30 making them very convenient for those who like to ski and hike, as Bromley Mountain is 6 miles away and Stratton Mountain Resort is only 15 miles away. The Torbank community is also only minutes from fantastic restaurants and shopping in the town center, as well local golf courses and walking trails. Residents of Torbank enjoy access to a pool, tennis courts and clubhouse. Recently updated condo with 3 bedrooms plus loft including master on main floor and 4 1/2 baths. Spacious living areas with wood burning fireplace and red oak floors. Electric dumbwaiter to bring firewood, groceries and luggage to main level. Skylights with adjustable shades. Bonus room on lower level can be gym, rec or use as needed. Only complex in town with attached 2 car garage. Great views, Pool and Tennis. Reasonable condo association fees. Convenient location. Call for an appointment.